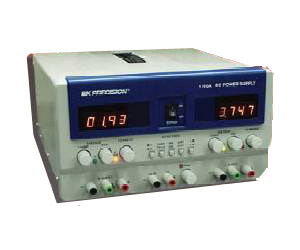 The BK Precision Model 1761 Triple Output DC Power Supply offers outputs with two 0 to 35V, 0 to 3A and one 2 to 6.5V, 5A outputs with two 4 digit LED displays. The 4 digit LED displays offer 10mV and 1mA resolution which provides higher accuracy. This makes it an ideal supply for power sensitive applications. The 1761 is fully overload protected and comes with a two year warranty.